Pythons in south Florida's canals and Everglades are tough to find, but one man caught a record 18-foot, 150-pound snake bare-handed. 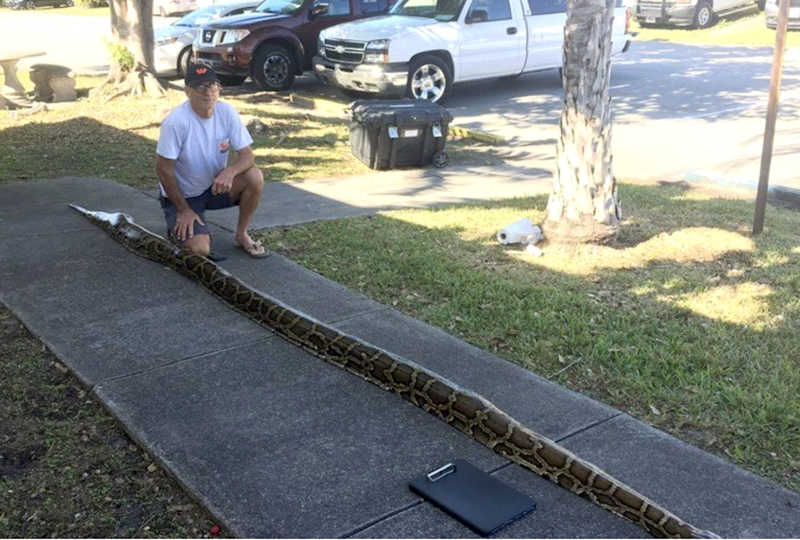 John Hammond was cruising down the road watching the canals in the South Florida Water Management District when a large Burmese python caught his attention. Hammond was participating in the SFWMD's python elimination program, which is designed to help selected hunters rid the Everglades and district's canals of the invasive snake. The best way to capture the snakes alive is by gripping behind their big heads to get them into a catch bag, which is what Hammond did. With such a big python, that turned out to be more of a wrestling match than he expected. “Ran down, grabbed it by the head. When I did that, it constricted me from the waist down, which was the plan,” Hammond told Fox35 last December. “The snake bags were too small. I had a tent bag in the truck. I coaxed it into the tent bag, and then the tent bag into a gang box." The giant python was 18 feet long and weighed 150 pounds. That broke the previous record, which was 17-feet, 5 inches, caught in November 2018. Selected python elimination participants are able to hunt on the SFWMD property. Pythons are captured and then euthanized by Florida Fish and Wildlife Conservation officials after they're checked. Hammond skinned the giant python for the hide. “It’s domestic leather, and if we can get to using it here, it’s not wasted,” he said.